Americans eat loads of chicken, but it seems so many recipes are tired and worn out. Poaching is a cooking method that's almost impossible to mess up, but many people forget about using gentle, steady liquid to cook meat, fish and poultry. That's a shame, because the flavor of poached food comes the closest to capturing the true essence of an ingredient. It's also a great way to cut calories without sacrificing flavor. 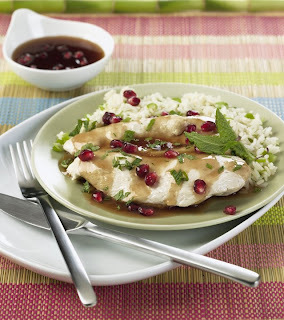 Poached chicken has a juicy flavor, a tender texture. It lacks the color and carmelization of fried or roasted chicken, but there's nothing to stand in the way of you and the pure flavor of the chicken. Here are a few recipes from the National Chicken Council that will ring in spring. Preheat oven to 180. In large, lidded sauté pan, melt butter for poaching liquid over medium-high heat. Add shallot and cook until translucent, about 3 minutes. Add star anise, red pepper flakes, ginger, thyme and chicken broth; bring to a bubbling simmer, but not a full boil. Add chicken cutlets, cover and reduce heat to a gentle simmer. Poach chicken, turning once, about 6 -7 minutes, or until cooked through. Remove to ovenproof platter and place in oven to keep warm. Remove star anise from poaching liquid; pour liquid into heatproof measuring cup. Add 1 cup poaching liquid back to the pan. Pour in pomegranate juice; add salt. Bring to a boil over high heat and boil hard until sauce is reduced and thickened, about 5 – 10 minutes. Remove from heat; swirl in butter until melted. Remove platter of chicken cutlets from oven, pour sauce over chicken. Garnish with mint. Place all broth ingredients in large stockpot or saucepan fitted with a steamer insert. Bring broth ingredients to a boil. 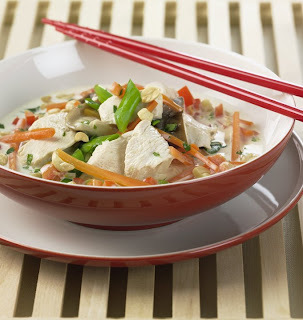 Place chicken, noodles, mushrooms, carrots and scallion in steamer basket, in individual piles, if possible. Cover and reduce heat to medium low. Steam until chicken and vegetables are cooked through, about 18 – 20 minutes. To serve, place serving of noodles in shallow bowl; top with portion of vegetables and chicken. Ladle broth over chicken mixture. Top with peanuts and chopped cilantro.